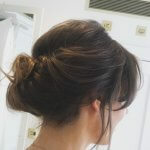 We love weddings at Admire, we always want to make sure the bride is 100% happy with her hair. We will always do however many trials it takes to get the brides hair perfect. On the 12th of February, our stylists Emma and Molly went to Greyfriars to do a wedding photo shoot with some amazing dresses from MiliMili in Colchester Town. With a very art deco theme, they decided to go with a very soft hair up with lots of detail in the back. This complemented all of the dresses used and also the makeup done by Scarlett Allen MUA. After the hair was set and the makeup was on, it was dress time. Over the day we shot 3 different dresses with beautiful detail and amazing trails. With some fun cocktail pictures to an elegant staircase picture. The photographer Andrew Mark Wade, really captured the true beauty of a bride, from their hair to the detail in their dress. Emma and Molly really enjoyed this amazing experience and hope to do a lot more like it in the future. Keep your eyes peeled for the professional photos to come out soon. In the mean time scroll down to see a glimpse of what our photo shoot was like. 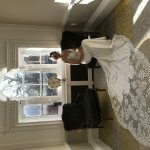 We would love to make you day as special as we have made many other brides. if you wish to inquire about making your day perfect, please feel free to contact us on 01206796707.